In our previous Tips & Tricks about Visual Studio, we learnt how easy it is to navigate from one method to another by using the Visual Studio menu Edit | Next Method and Edit | Previous Method. Wouldn't it be more easy if we had a keyboard shortcut mapped to the functions to perform the said navigation? Yes, it is! 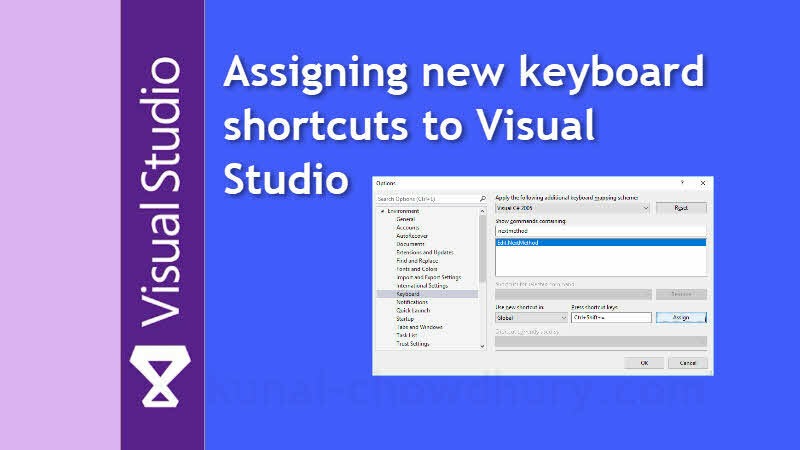 Here we will talk about the step-by-step process to map a Visual Studio command with custom keyboard shortcuts. Now, to assign keyboard shortcut keys for the mentioned Visual Studio menu commands, navigate to the Visual Studio Options page by clicking Tools | Options... menu items. Now, navigate to Environment | Keyboard, as shown in the below screenshot and then search for the command containing the text nextmethod. This will filter out the result and list Edit.NextMethod as shown below. Click on the input box under the Press shortcut keys and press the keyboard new key combination that you want to assign against the command. In this example, we have assigned Ctrl + Shift + = as the shortcut key. Click the Assign button. Similarly, to assign keyboard shortcut for the other command, search for previousmethod. This will filter out the result and list Edit.PreviousMethod as shown below. Now, click on the input box under the Press shortcut keys and press the keyboard new key combination that you want to assign against the command. In this example, we have assigned Ctrl + Shift + Alt + = as the shortcut key. Click the Assign button and hit OK to save the changes to Global settings. Similarly, when you find another Visual Studio command, for which no keyboard shortcut has been assigned by Microsoft, you can now easily add your custom keyboard shortcut to it. Make sure that, you are not overriding any existing mapping. Also make sure that you are saving the changes in the Global settings, so that, the changes are available in your system for all new instances of Visual Studio. If you have come this far, it means that you liked what you are reading (Visual Studio Productivity Tips: Assigning keyboard shortcuts to Visual Studio commands).